I have no balance!!! Well, I'm always striving for it. It's just elusive. You know I think The Tension of Opposites is an AMAZING book. I'm so glad you found it and put it in my hands to read. I haven't read Tension of Opposites yet, but I'm dying to since I absolutely LOVED One Moment. I know, Sarah! I love The Tension of Opposites; it's such an intense and moving story. Sara, right on. Books that combine both happy and sad elements are the best. TFIOS certainly has it all. One Moment is great, too-- it sucked me right in and I couldn't put it down. 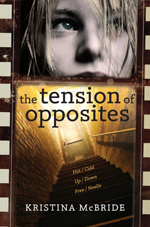 I haven't read TENSION OF OPPOSITES yet -- I'm not sure how that happened! -- but I HAVE been thinking about balance a lot recently, so your post really resonated with me. :) For me, it's about using my time wisely. I'm on the computer all the time, but that doesn't mean I should be *connected* all the time. I need to learn how to balance my time/energy for the most important things (my family, my writing) and limit how much of it I give to everything else (FB, Twitter). GUITAR NOTES (which we have blogged about a bit here at WHYA) is sort of about balance, too. The balance between what's expected of you vs. your passions, structure vs. freedom. I really appreciate stories like that, which can show you that things aren't black or white, that you have to learn to find your place in the gray.